Set sail from Marblehead Harbor in one of Atlantic Charter’s well-appointed sailboats for a day of sailing with your family and friends, or for a longer excursion — a weekend sail around the outer islands, or a weeklong sail down to Cape Cod. Memberships are never required with Atlantic Charters! Before renting any of our boats for the first time, you will need to take a short check out sail with us to demonstrate your ability to sail independently. 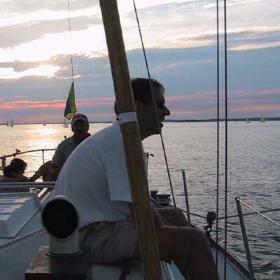 Check out price is $45 in addition to your initial sailboat rental fee. If you are interested in sailing, but do not meet our safety and seamanship requirements, you are welcome to join us for a private refresher sailing course, or for a complete “Learn to Sail” program in one of our group sailing classes. Upon successful completion of our courses, you can then rent one of our sailboats and get out on the waters on your own! Call for pricing and availability of Friendship Sloop Resolute.